Welcome to Week 1 of the Spring 2018 edition of The One Room Challenge HERE! A big thank you to Linda from Calling it Home HERE and media partner, House Beautiful HERE, for organizing this fabulous event! 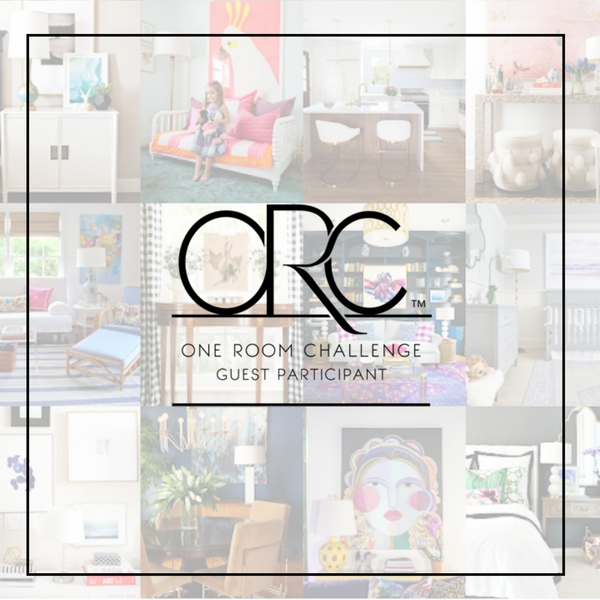 One Room Challenge™ is a widely anticipated biannual event every April and October. Each round, twenty design bloggers take the challenge and transform a space. Every Wednesday, the designers document their process while sharing their sources and professional advice over six weekly posts. Definitely check out their posts for amazing design inspiration! Last year, I participated in the “One Room Challenge” as a guest participant, and showcased our Kitchen Renovation, it was a massive effort of painting 60 cabinets including 2 islands, installing new hardware and new glass for the cabinets, new lighting, renovating a fireplace and furnishing the kitchen. You can catch up on the details and the final reveal HERE. The season before last, I took on a master bathroom renovation in our prior home. That project involved gutting a built-in tub, replacing the floor and wall tiles, adding new lighting, new hardware, granite countertops, painting the vanity cabinets, installing new glass for the shower surround, and installing a rain-head shower system. You can read all the details about that renovation HERE. This season, I am joining again as a guest participant. I will post updates to my renovation project every Thursday for 6 weeks and post the final reveal on May 10, (Week 6). This season’s project will entail an update to our Basement Bar Space. The space is really wonderful with plenty of cabinets and an enormous center island. But the space feels dated and the lighting…uhh..let’s just say doesn’t work with the space. The area includes a double sided fireplace, which is a bonus but the mantel needs updating. The brown and yellow tones are making the space feel old. I want to bring in more contemporary colors to make the space come alive. I will paint the cabinets, install new hardware, new lighting, new glass panes, paint the room and bring in new furniture. Initially, my plan was to renovate the cigar room you see in the distance into a Wine Cellar for this season of the ORC. But when I started talking to companies about my project, it quickly became apparent that I was not going to be able to complete the job in the 6 week timeframe. So sorry to disappoint you all who were looking forward to following along with the wine cellar transformation…but the good news is that with a bit of a head start, my plan is to showcase the project during the 2018 Fall edition of the “One Room Challenge”! So stay tuned!!! Lots of fun projects coming up at Happy Haute Home! Follow along on Pinterest HERE , where I get a lot of inspiration. Also, follow along on Twitter HERE and feel free to pin and tweet your favorite pics from Happy Haute Home. I hope you don’t get too stressed about it! I am looking forward to following along. I can’t wait to see the progression of this renovation! I love wine and one day hope to have a wine cellar in my home as well! Good luck! Thank you Toya! I hope to share tips I have learned along the way, so glad you will be joining my adventure. How unique! You don’t see too many wine cellars in the ORC. Can’t wait to see how you make this space your own. Happy decorating! Yes they do! Hope it will all turn out in the end, can’t wait to see everyone’s reveal! Well….after learning how long it would take to design, build and install the racks..I had to change to another project for this challenge. So with a bit more planning, I will complete the project for the Fall ORC. Thanks Susie! Appreciate you visiting. All the best with your wine cellar renovations. And yes, a wine cellar sounds much more fun than a powder room. Looking forward to seeing your weekly progress (and of course the final reveal)! So true! I’ll drink to that too! Thanks for visiting. Oh, this is going to be fabulous! I cant wait to see this transformation! Thank you Nick! Our house has many challenges but the space the great. Appreciate you following along!